In my last post I gave my first impressions on the Canon 7D Mark II once I had used the camera in a real world situation. In that post I covered how the camera handled at a professional rugby match. The only real disappointment I had was that the lights at the stadium were very good and meant that I didn’t need to push the ISO beyond 1600 to get the shutter speed and aperture needed to isolate and freeze the action. As a commissioned match I didn’t want to experiment too much as it was key to capture the required images. This weekend I didn’t have a commission so looked for a game to attend that would test the ISO capabilities more. I received accreditation for a game at Sandy Park featuring local rivals Exeter and Bath in the LV Cup. Sandy Park is a fantastic stadium and the people there are amongst the friendliest I have encountered whilst covering rugby. Also the stadium is due to host some pool games in the 2015 Rugby World Cup, however the stadium is still being developed in preparation for that. Whilst the lights were pretty good there was considerable falloff in the corners and sides. The middle of the playing area seemed to settle at about ISO 2500, however other parts of the pitch registered up to ISO 6400. 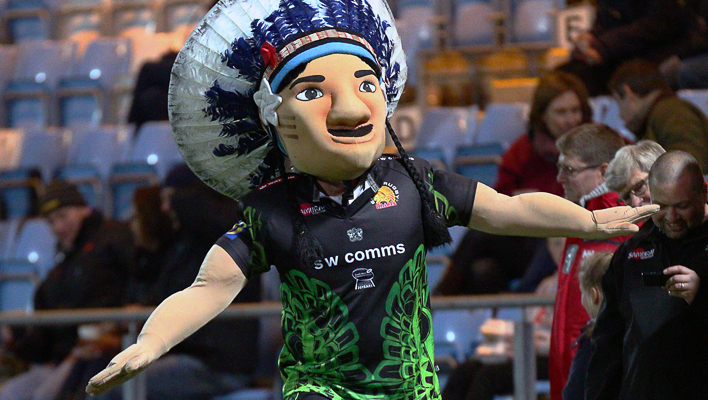 Also at half time I took a photograph of the Exeter Chiefs mascot dancing in front of the fans, this shot registered at ISO 8000! Because of the variability of the light I setup the camera in manual to fix the shutter speed and aperture but used auto ISO. One of the great new features on the 7D Mark II is the ability to use exposure compensation when using Auto ISO in manual mode. For this game I set the exposure compensation at plus two thirds of a stop. This seemed to be about right for the circumstances with evaluative metering. With the original 7D I was very wary of using an ISO above around 1250 and would lower the shutter speed to compensate. Therefore I was really keen to see how the camera performed in these conditions. As with the previous week I had my spare 5D Mark III in the bag, whilst I wanted to test the camera if at any point it became unusable I would switch bodies. As I had set Auto ISO i didn’t know what value would be used on an image until I checked the EXIF data in the photograph. Whilst there is clearly noise in the photographs the image quality is simply astounding, it’s not just that the images are cleaner but the fact that the noise has a more film like quality. With the original 7D the noise kicked in at relatively low ISOs but also had a pattern that made the image quality drop off considerably. Another factor with the original 7D occurred when an image was cropped, I found that you really didn’t want to crop the image too much otherwise the image quality suffered. Again this is an issue that I feel has been addressed by the 7D Mark II. With any camera if you over crop you will lose definition but with the first 7D it became a problem even with relatively low level cropping. For this game I also used the opportunity to experiment with the AF settings and am pretty happy with the outcome but I’ll save that for a future post. Personally I would have been delighted if the ISO settings were useable up to 6400, which would suit the majority grounds I normally attend at the extremes. The mascot shot at ISO 8000 is more than usable and gives me total confidence in using the 7D Mark II in pretty much any situation that I would encounter. Hopefully my experience in relatively tough conditions will give you the confidence to have a look at this camera. I truly think this is a game changer for me. I have included a few shots from the game, with their ISO Settings shown, please note all images watermarked CameraSport are subject to their copyright and may not be used for any other purposes.